Today, the International Chamber of Commerce’s (ICC) largest education event, ICC Mediation Week, officially kicks off in Paris. More than 500 students, ADR practitioners and volunteers from across the globe are set to embark on a week-long journey of learning, networking and fun. Here are four things to know about this celebrated annual event. From 8-13 February, 65 university teams will compete in almost 150 mock sessions for the 14th edition of the ICC International Commercial Mediation Competition. 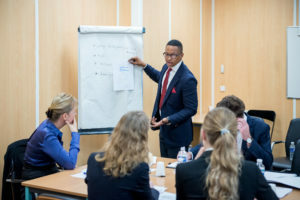 Hailing from 32 countries and some of the world’s most prestigious schools, students are asked to take on specific roles in simulated mediations, while showcasing a variety of skills, from active listening to questioning. Seated at the other end of the mediation table are some of today’s top ADR professionals who participate in the Competition every year as mediators and judges. They help guide students in an effort to enhance abilities and talents, encouraging and nurturing a new generation of professionals. All cases are inspired by real-life business disputes and crafted by an elite group of practitioners who make up the Working Group for the Competition Problems. So what’s at stake? Not only can winning the Competition launch student careers by opening doors and opportunities, but it also offers an array of prizes — from a one-year subscription to the ICC Digital Library to sought-after internships at leading institutions. Attended by the more than 155 dispute resolution professionals and academics participating in the Competition, ICC Mediation Week also plays host to the Mediation Roundtable. Taking place on 11 February, the event combines insightful presentations with dynamic interactive sessions and provides a forum for global conversation between practising professionals. Highlights from the 2019 agenda include a stimulating “speed-dating” style discussion; a debate on the Singapore Convention; and a workshop on “go to moves” and other hacks that mediators can have handy in their professional toolkits. New to this year’s event is the Inter-generational Roundtable. Designed to further connect students and professionals, this event weaves together expert insight and best practices in an effort to respond to some of the specific challenges that up-and-coming professionals face in today’s workplace. With topics like the accessibility of the mediation process to bridging the gap between digital natives and digital immigrants, the roundtable will serve as a safe space for participants, of all ages and stages of their career, to engage in meaningful discussion and learning. It’s true that ICC Mediation Week does have a competitive angle — but it’s so much more than a just a tournament of skills. The seven-day event also includes a range of social and networking activities to help boost professional networks of both students and practitioners alike. What’s more, they take place in some of the French capital’s most impressive venues. So whether you’re exchanging tricks and tactics with colleagues and teammates from other countries or simply enjoying the sparkle of the City of Light, all of our ICC Mediation Week happenings are about community and relationship building. ICC would like to expressly thank its long-term advocate, Clifford Chance — our Competition’s Headline Sponsor — and our many other partners and supporters, for their ICC Mediation Week commitment and kind contribution. Be sure to follow all the ICC Mediation Week action via our Facebook, Twitter and Instagram accounts. Even participants also have the possibility of downloading our official event app, thanks to ADR/ODR International and the European Institute for Conflict Resolution, by searching “Ugenie” in thier app store.